Salt, water, flour, oil, yeast. Simple for some, but daunting for others. The measuring, the mixing, the rising, the baking. The test – the eating. I grew up in a homemade house. Everything we ate came from the barn, the garden or a very few store bought ingredients added to said barn or garden variety. My mother and grandmother baked and cooked daily as I watched and listened and practiced alongside them in the kitchen. Homemade yeast rolls were a staple at each holiday gathering. I gave up on the 4-H fair the year I would have taken yeast rolls. They scared me – a lot. Getting the temperature just right to dissolve and activate the yeast seemed too hard. Impossible. It would be nearly a decade before I would try my hand at bread, something other than banana or pumpkin, and feed it to my family. I started with a bread machine.. I made everything I could in it and began to gain some momentum. We ate sweet potato bread, whole wheat bread, Challah bread, and old-fashioned white bread. I even made pizza dough in it. I enjoyed it – fast, simple, and I could walk away from it and let the machine do all the work. Quite handy for a young mother of three. But I always felt a little cheated. Surely I was missing something. Something delicious. When my machine finally let out one last puff of steam, I knew I needed to try. I would need a recipe. Pizza dough seemed safe enough. I dug out my trusty Joy of Cooking cookbook and scanned the index for pizza dough. Sure enough, there it was. 1 and 1/3 cup warm water, 2 teaspoons yeast, 4 generous tablespoons olive oil, 1/2 teaspoon salt and 4 cups flour. I’ve memorized it. It was delicious and extremely satisfying to create, but I wanted bread. A huge loaf of warm goodness I could smell throughout the house. Something we would devour. Something we would love. And my good mother came through for me the way she always does. French Bread. No-knead French bread at that! It has basically the same ingredients as the pizza dough, just different amounts and a little sugar. It makes the most delicious loaves of sliced heaven this side of heaven. When I bake them, my family can hardly wait to eat. It draws my teenagers out the depths of their rooms. It calms and then excites my youngest all at once. It is called dabo in his first home and it is sustanence to him. His first morning with our family, he filled his hungry and scared stomach with six slices of it. My middle boy, he just hugs me and asks for the first slice. It is his favorite. I am in love with this bread. These simple ingredients that come together into something I love. How does it work? How do they mix and rise and change into something so desired, so satisying, so beloved. HE is the something so desired, so satisfying, so beloved. So I have begun baking bread. I am measuring, mixing, forming, baking and eating bread. My recipes design is for two loaves. One to eat, one to share. 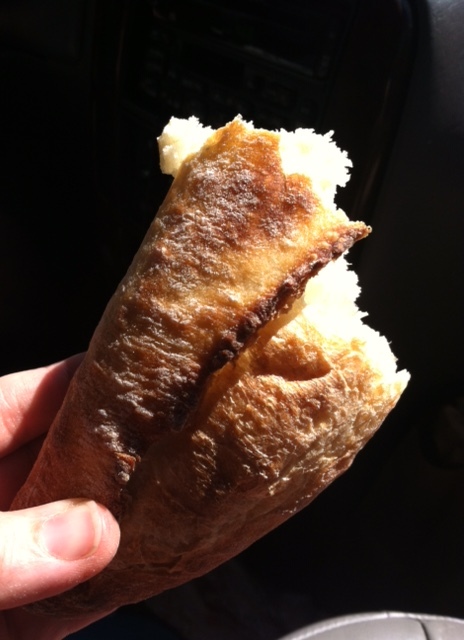 And I remembering this mysterious charge to eat the bread of life. If you believe, if you follow, if want more than just consumption, if you want to really be filled, “Eat my bread,” Jesus says. And the contentment you receive is not flour and yeast and oil, but of scarred hands and feet and body, his forgiveness. His love.